Philip A. Salem, M.D. is a world-renowned cancer specialist, researcher, educator, author and international medical statesman. For over 50 years, Dr. Salem has successfully treated tens of thousands of cancer patients. He also was a member of the White House health are advisory committee for five years, during the administrations of President George Bush Sr. and President Bill Clinton. He has published extensively on Immunoproliferative Small Intestinal Disease, and the causative relationship of infection to cancer. His research was crucial in the development of new anti-cancer agents. He also developed new methods for delivery cancer agents. He also developed new methods for delivering cancer drugs to patients to reduce toxicity and maximize efficacy. He served on the faculty of the M.D. Anderson Cancer Center in Houston, Texas as a professor of cancer medicine from 1987 to 1991. In 1991, Dr. Salem was appointed Director of Cancer Research St. Luke’s Episcopal Hospital in Houston, Texas, now known as the Baylor St. Luke’s Medical Center, CHI St. Luke’s Health, where he is currently Director Emeritus of Cancer Research. Also in 1991, Dr. Salem established the Salem Oncology Center, a private cancer facility in the Texas Medical Center in Houston, Texas, where he continues to serve as President. In 2010, St. Luke’s Episcopal Hospital established the Philip A. Salem Chair in Cancer Research to honor Dr. Salem’s contributions to cancer medicine. Neal Howard: Welcome to Health Professional Radio. I’m your host Neal Howard, thank you for joining us here on the program. We’re going to have a brief conversation with Dr. Philip Salem. Now Dr. Salem is a former White House healthcare adviser to both President George Bush and Bill Clinton and he’s joining us here on the program to talk about his upcoming book ‘Defeating Cancer: Knowledge Alone is Not Enough.’ Welcome to the program Dr. Salem, thank you for taking the time. Dr Philip Salem: Thank you. Neal: Now I mentioned some very impressive credentials – a former White House healthcare adviser for presidents George Bush and Bill Clinton. Give us a little bit of your background, maybe what led up to you being adviser to two presidents. Dr Salem: Well I’ve been in cancer medicine for 50 years. When President Bush chose Dr. Lee as his personal physician and the czar for healthcare in America, Berkeley was a great friend of mine. He asked me to join an advisory committee to the White House on healthcare and that’s how I came to serve on that committee. I was a member of twelve experts and our job was to provide advice and recommendations to Dr. Lee and in turn Dr. Lee will take these recommendations to the administration and to the president. Neal: o you have become an author. Is this your first work or is this one of several? Dr Salem: No, I’m a writer and I’m Arabic. I speak Arabic originally Lebanese and love to write. I come from a family of authors and this helped me a great deal in articulating issues with patients. I love to write, this is the second book in English about my experience in cancer. The first book is entitled ‘Cancer, Love and the Politics of Hope’ just to emphasize the importance of love and hope and the treatment of the cancer patient. There is a big issue in America in regard to the treatment of the patient. We should always remember that when we treat cancer, we’re not treating a disease, we sometimes forget the human behind the disease. Neal: Now there’s as you say a misconception of what standard therapy, being I guess the top three traditional treatments for cancer depending on the type of cancer. Why is that not always the best course of action for a patient especially a cancer patient? Dr Salem: Right. Standard therapy means that it is the best treatment that a consensus of experts decide upon. And when you need a consensus, there is a lot of compromise. Now, standard treatment is good but many times from the time standard treatment was instituted or was established, progress would have been made and the better treatment would be available. That just takes time for the better treatment to become a standard treatment. Now my argument is that the patient should receive at any point in time the best treatment available for them, whether it is considered the standard or not standard. Sometimes, it takes two or three or four years to make a very effective and good treatment, a standard treatment. I don’t want the patient to lose the opportunity to receive the best treatment until the treatment becomes labeled as the standard. The big issue here is that when doctors resort to treatment which is not standard but it could be much better than standard, they are exposed to litigation and therefore doctors shy away from giving treatments which are the best to avoid litigation and to protect themselves. Neal: Well it seems to me that a diagnosis isn’t a simple thing of diagnosing and then immediately starting what you consider to be the best treatment. It seems that it would be necessary to take time to start a treatment. So I guess starting immediately or investigating several different treatments based on the patient and the diagnosis, is that correct? Dr Salem: That is correct. A big mistake and a very common mistake made in America and all over the world is that the treatment will be commenced immediately after the diagnosis was made and this is a big mistake because you need time when the diagnosis is made to confirm the diagnosis which is a very important issue because many times, the initial diagnosis could be either imprecise or even incorrect. You shouldn’t start a treatment before you are 100% certain of the exact nature of the disease and then the second step is you need to stage the disease. You need to know whether the disease is still localized to the organ where it originated or whether it has spread to the rest of the organs of the body. 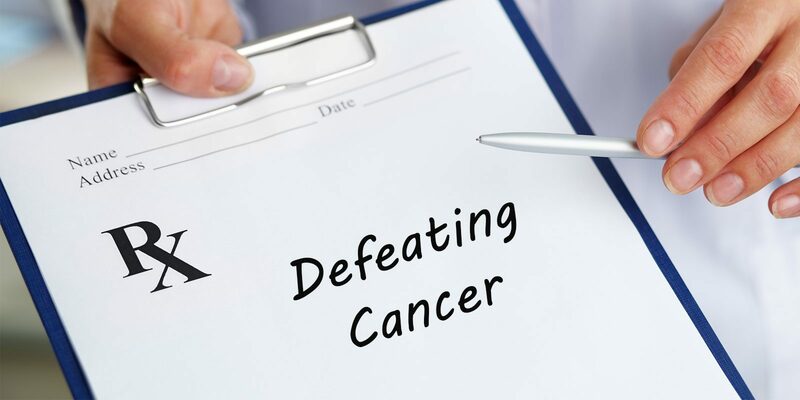 And the third step before you start treatment is to obtain a group consultation with experts because the treatment of cancer entails many disciplines, entails chemotherapy, immunotherapy, targeted treatment, surgery, radiation therapy and knowledge has been very explosive. There is no one doctor who knows everything about these treatments and therefore the group consultation in my opinion prior to starting therapy should be a must. Neal: Now in your book ‘Defeating Cancer: Knowledge Alone is Not Enough,’ now we’ve talked about having the knowledge through diagnosis and doing the research and finding out which is the best course of action for each patient who’s going to be treated. As you say knowledge isn’t enough, you mentioned the human factor early on in our conversation. How does your book address dealing with people as humans rather than simply a disease that you’re trying to eradicate or cure as quickly and as effectively as possible? Dr Salem: Sure. Doctors sometimes ignore issues other than knowledge and these issues are crucial to the achievement of cure. You cannot treat a patient for months or years without establishing an excellent relationship with the patient. Let’s take love, compassion, caring, accessibility to the doctor which is a very important issue nowadays because doctors are immersed in paperwork and a new routine starts, they have little time to sit down and talk to patients. And you have to instill patients with hope and push them for perseverance. Without hope and perseverance, it’s difficult to cure a patient. Dr Salem: I would send you one to make it easy for you. Neal: Thank you so much. Do you have a website that we can go to and learn more about you? Neal: Thank you. Dr. Salem, it’s been a pleasure. Thank you so much for joining us here on the program and we are hoping that we can talk again sometime in the future. Dr Salem: Thank you very much.